Mearns Community Transport (MCT) runs a variety of different transport schemes, available to the residents of the Kincardine and Mearns area. MCT believe community transport is more than getting folk from A to B. It is about social inclusion, tackling isolation, providing independence and opening opportunities. 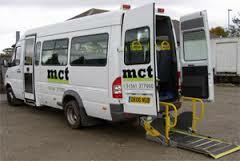 The primary service run by MCT is the Community Minibus, which is a fully accessible minibus available for hire to all community groups and organisations in the Mearns. The vehicle is a Mercedes Sprinter minibus which can carry 15 passengers and is available for hire to all community groups and organisations in the Mearns and can be used by these groups for outings or events etc. The bus is operated under a Section 19 permit which means we are always happy to hear from people who would like to be volunteer drivers. From October 2009, all community groups hiring a minibus from the Council must use a driver who has successfully completed a MiDAS course. MiDAS is an initiative sponsored by the Community Transport Association to promote road safety and is nationally recognised by the Police and the Royal Society for the Prevention of Accidents. The course is in 2 parts; Theory 6 hours and Practical up to 1.5 hours. The driving module covers the legal requirements for carrying passengers in the vehicle, passenger and personal safety, road safety awareness and defensive driving. The second module is optional and trains drivers to assist and carry passengers in wheelchairs. Minibus drivers are then required to undertake a formal assessment of their driving skills. MCT provides MiDAS Training with our qualified Trainer and Assessor. Last year we introduced offering Passenger Assistance Training (PATs) which can apply for anyone who cares for passengers travelling by road. Two other key schemes provided by Mearns Community Transport are Wheel 2 Work and Benholm Bikes. Wheels 2 Work aims to help people who have transport issues getting to work, education or training by providing access to a scooter which members can loan for a small fee. We provide riders with their Compulsory Basic Training (CBT) which gives them the skills they need to ride safely. Benholm Bikes is a community-based workshop which recycles unwanted bikes and teaches maintenance while promoting cycling. We are always keen to hear from people interested in helping with one of our schemes or becoming volunteer minibus drivers. We would also like to attract some new members onto the committee. We also have a vacancy currently for a Maintenance/Driver post which is approximately 2 to 3 hours a week. Please contact the office on 01561 377 000 for more details and information. This entry was posted in Local Blog and tagged Aberdeenshire, community, health improvement, healthy lifestyles, transport. Transport in Kincardine and Mearns – What’s the latest?